Making stuff for the little ones has been a lot of fun and I can’t wait to hear what my friends with children think of what I’ve made their wee ones! 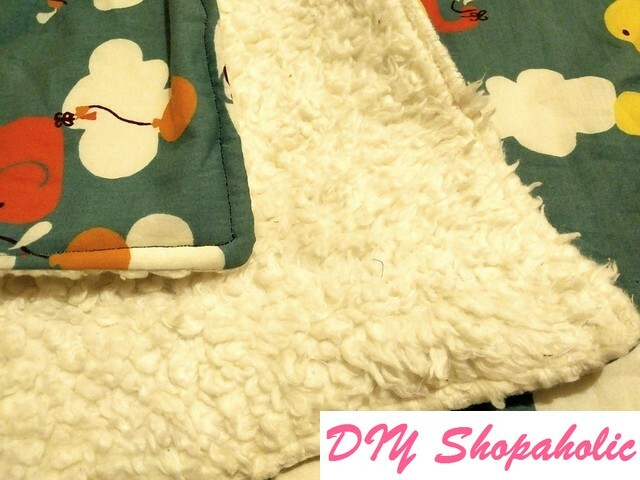 A project that I really enjoyed was making children’s faux fur blankets because 1) it’s important during these cooler days and nights and children catching a cold is definitely not something you want to happen, and 2) it’s so easy to make. If you’re still thinking of last minute Christmas gifts, this will be a perfect, easy and quick project to whip up in a jiffy! I’ve made a blanket/throw for myself before (see here) and this is somewhat similar although on a smaller scale. The faux fur throw was quite warm and I’ve used it on its own on a few occasions during cold nights. The combination of the faux fur fabric with the fleece made it a very warm blanket indeed. With children’s blankets, I wanted something that would still be cosy, but versatile enough to be used in the cot or out and about in the pram. I also know that babies can’t be too warm or too cold and the materials need to be breathable, so I wanted to make sure the materials I used were suitable and met these requirements. One thing I would always recommend you to do before you start sewing is to pre-wash your fabrics. I don’t usually do this for my own dresses as I tend to wash these on the handwash setting on my washing machine to preserve the life of my garments, but parents who are looking after young children want minimal fuss with their clothes and laundry as much as possible. All fabric shrink, but the percentage of shrinkage varies between fabrics. After the first wash however, there should be no more shrinkage so you know exactly how much fabric you’ve got to work with. Without further ado, here’s my tutorial for a children’s faux fur blanket. 1. First of all you want to make sure that both the cotton fabric and faux fur or fleece are the right dimensions. To do this, from the selvedge line measure 80cm from the top and mark this point. Measure 80cm again down the selvedge and at right angles, measure 80cm and mark again. Now you should have 4 markers for a 80cm square piece. Cut these out. 2. Now laying the right sides of the materials together, smooth out any creases and bumps so that the pieces are as flat as possible. You’ll want to make sure the edges and corners meet and pin. 3. 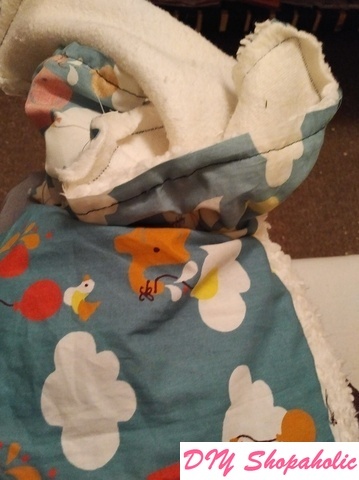 Like I did with the hooded towel (see here), sew along all 4 sides using your regular seam allowance (I normally use a 5cm seam allowance, but used the side of my machine foot as the allowance in this case). Remember to leave a gap of at least a few inches for turning your blanket inside out later. For flexible and thinner material (like loose pile faux fur), you can leave a 2-inch gap, but thicker material (like fleece and densely piled faux fur fabric) leave a 3-inch gap. 4. Snip the 4 corners of the materials. This will allow for the corners to be turned later on. 5. Through the opening you’ve left, feed the fabric through so that the blanket is now right sides out. Depending on how wide your opening is, with thicker fabric and a smaller opening, this can take a bit of time. 6. Now reaching into the opening again, poke your finger into the 4 corners so these are fully turned out. 7. To close the opening, first separate the faux fur from the cotton along the stitched seam as much as possible. Now fold this so the faux fur is not visible from the front side of the blanket and pin in place on the cotton side. This should give you an idea of how much fabric should be turned in so pin along the opening (make sure there is no puckering to the opening) and around the rest of the blanket. 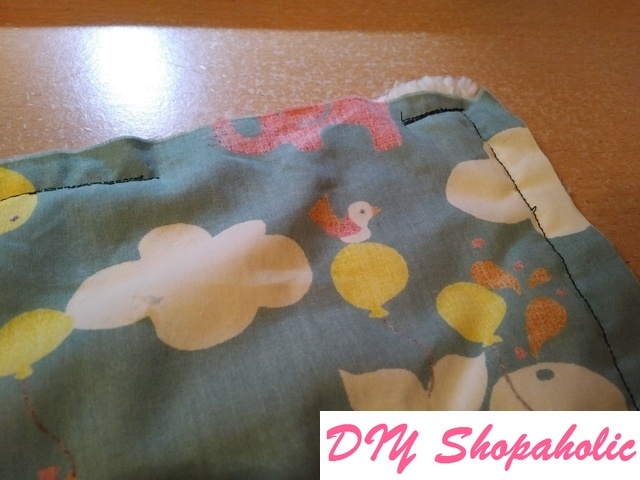 This is to stop the seam from bubbling over and keeps the look of your blanket. 8. 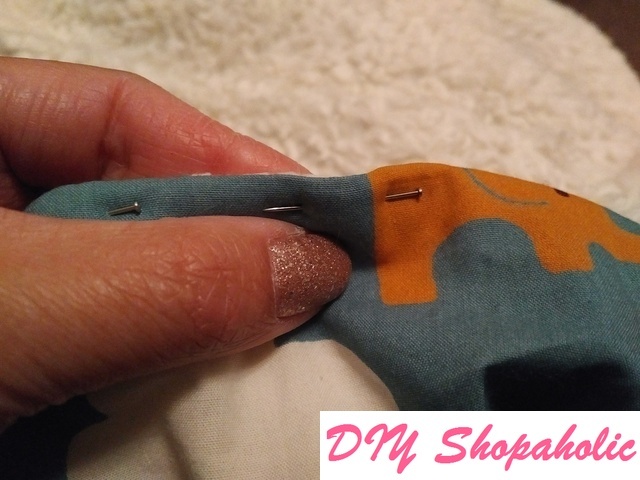 Now as we did for the hooded towel tutorial, I deliberately suggested pinning on the cotton side so you will be sewing with the cotton side facing upwards. This makes changing the spool of thread easier if you’re working with different colours. With the cream coloured faux fur/fleece on the underside, I kept the white/cream coloured thread in the bobbin. 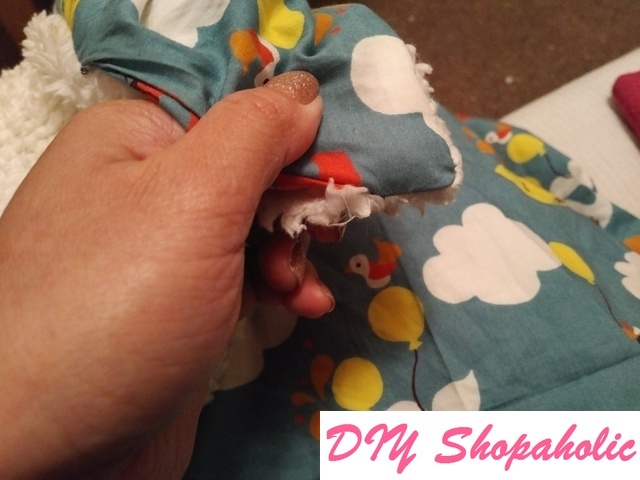 This will mean that your coloured thread will match the cotton fabric while the cream coloured thread in the bobbin will leave an invisible line of stitching through the faux fur/fleece. If you prefer to do it the other way, just make sure the bobbin is filled with coloured thread and the spool of thread to match your fleece/faux fur fabric is at the top and you’re matching the placement of thread with the fabric (ie fabric facing upwards should match the spool at the top of the machine while the threaded bobbin should match the colour of the fabric facing downwards). 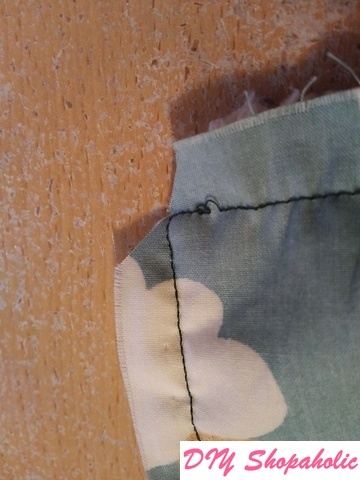 Once you’re happy with the thread placement, start sewing along all 4 sides. To make sure the opening is closed, I used the inner notch on the foot this time so the outside seam is smaller than the inside line of stitching to ensure it’s closed off properly. 9. Shake off your blanket and check for any loose threads and you’re done! Since you’re only working with 2 pieces for the blanket, this is a very simple project and very quick to do. I must have taken about 3 hours to make 3 different versions of the blanket. Depending on how cold it gets during the winter or whether you’re anticipating the blanket will be used indoors only with the heating on or not, you can choose different weights of fabric to suit your needs. As you can imagine, heavier fabric will be warmer as it’s more closely knit while lighter fabrics will be thinner and loosely piled. I made the loosely piled faux fur blanket for a friend in Spain as I imagine during the winter it’s not as cold as Scotland. 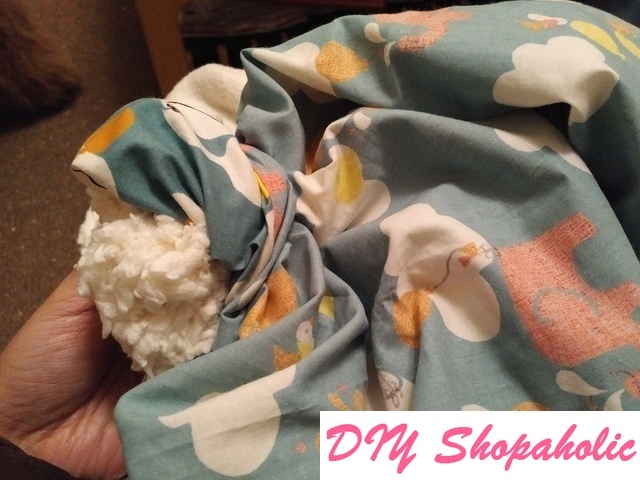 The fleece and densely piled faux fur blankets are for a friend who’s expecting in the next few months so I decided to make a warmer one for going outdoors and a lighter one for indoors and spring/autumn weather where it can still be quite chilly. There are lots of ways to make a blanket, but this is the easiest way. If you’re really creative, you can stitch designs onto the front side, make a patchwork or quilted design. 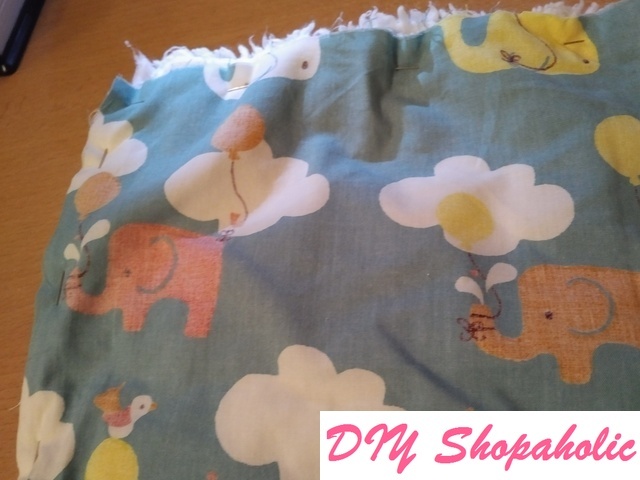 I’ve recently received organic cotton fabric for another children’s blanket I intend to make soon with a pattern on the front and a patterned fleece back so that way, I’ve also made a reversible blanket! You’ll want to try to match the colours and patterns though so they’re not too busy to look at, but the possibilities are limitless. 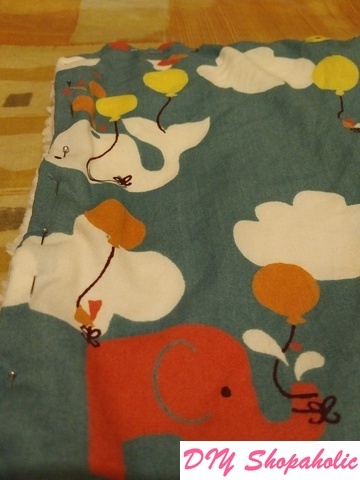 Have you made a blanket for children before and would like to share your designs? 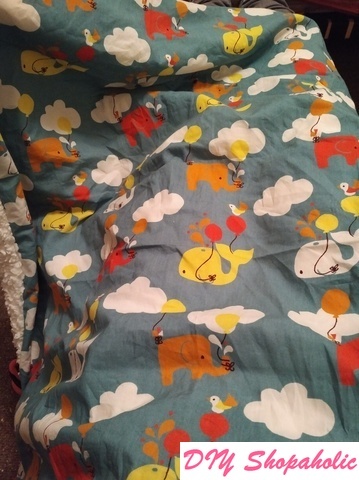 Comment below if you’ve got any photos of your blankets or have suggestions on how to make the blankets quickly and more easily! 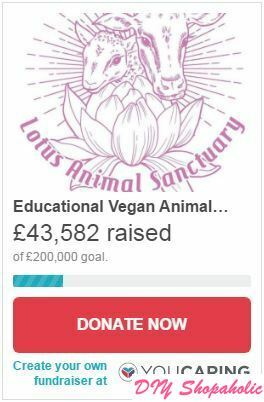 Previous Cruelty-free Christmas present shopping!